Around the Moon follows Barbicane, Nicholl and Ardan as they journey to the moon in their projectile. All seems well, until they realise that they have been knocked off course and may miss the moon entirely. As a lot of my previous review covers suspension of disbelief, I will quickly address how Around the Moon compares in that regard. It is so much worse. 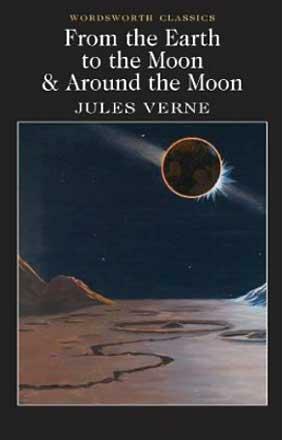 While I could kind of wave away a lot of the previous installment with the sentiment that the principle is more or less sound, when almost the entire plot focuses around the characters noting down their observations of the moon, or what the 19th century thought the moon would be like, it is extremely difficult to ignore or wave all the ways that this is wrong. Like the point where they open a window in order to dispose of an animal carcass into the vacuum of space. It is points like that that make the suspension of disbelief so much more difficult this time around. If you can deal with imaginative departures from fact, then you may find this less distracting than I did. Now to the part that is special to Around the Moon when compared to its predecessor. The action, bar the last few chapters, all takes place within the confines of the projectile fired at the end of the previous installment. Now, when you have a story occur in entirely one place, your writing skills are pushed to the limit, especially if none of the characters can leave said place. There are two things that need to work near enough perfectly for such a situation to work: the pacing and the characters. To say that Verne dropped the ball may be an understatement. In regards to the pacing, it kind of settles on a slow trudge due to most of the action being the observation of the moon and space. There are a couple of points where the projectile is almost hit by asteroids, but there's nothing that the protagonists can do in the face of it, so it doesn't really stop the monotony of watching a huge deal. As such, the characters become even more important, and it couldn't have been a bigger catastrophe if it tried. Of the three main characters, two are flat caricatures of the practical American stereotype that Verne seems to love, and even their supposed intelligence is put to question considering that they only consider how they are meant to get back to Earth once they are well past the Earth's atmosphere. They are nothing compared to the irritation that is Ardan though. You know in some series you get those characters that are meant to be charmingly whimsical but end up being a vacant ninny infatuated with their own stupidity? Michel Ardan is that character. He keeps suggesting things that are blatantly ridiculous or dangerous for them to do whilst on the journey, only to moan that his travel companions are too practical and boring when they inevitably poke holes in his ideas. Honestly, I was kind of hoping that he would ignore them at the point where he wondered what it would be like to float along in the wake of the projectile. By all means Ardan, throw yourself into the icy vacuum of space, it will be the most use you've been all trip, especially after sneaking a flock of chickens on board for no real reason.